A few months ago, I started this thread - Anyone mounted UCS MF on a motion TV mount? So, what happens when you take one of these (tv mount) + add one of these (UCS MF) + whole lot of time & a little engineering = what do you get? 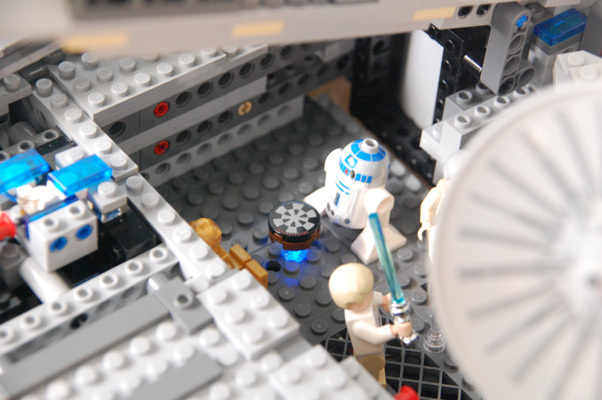 Now, you may also recall many moons ago, in a galaxy far far away, when Lego produced the 10179 UCS Millennium Falcon, Hasbro also saw fit to revisit and update their Millennium Falcon playset - which debuted in a larger size with added play features, lights, and improved sounds. By coincidence, both sets were similar in size. Thus, a crazy (and somewhat expensive) idea was hatched. WHAT IF, Lego and Hasbro had collaborated to produce THE ULTIMATE Lego MF? With lights and sounds and play features?! So, what happens when you take one of these (Legacy MF) + add one of these (UCS MF 10179) + some creative MOC-ing = what do you get? You get something like this. Whenever possible, I did my best to come up with a Lego-based solution for the play features and electronics. I did have to cheat in a few places - mainly, drilling holes for front mandible lights and holes for the electronic buttons. 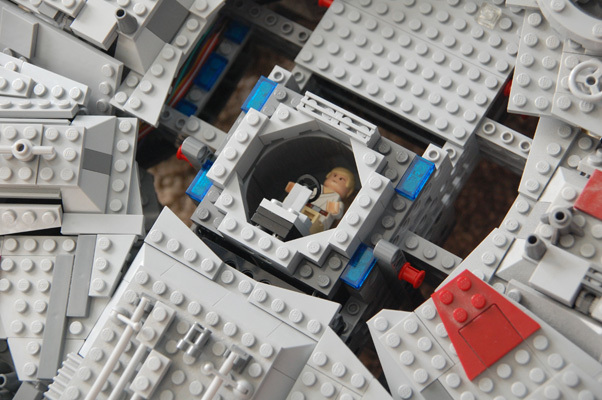 But otherwise, everything you see is completely Lego based. A few times, the wire connectors broke. So, my build experience included learning the art of soldering. My results weren't very pretty, but luckily all the electronics worked in the end. NOTE: Three (3) sound buttons are still unused - escape pod release, escape pod hatch, and gunner chair sound #2. (gunner chair sound #1 is on the starboard rear panel.) I haven't figured out exactly what to do about these - so those are still pending. If I can figure out how to record and post video - I'll post later. Last edited by etcknight on Thu Feb 28, 2013 2:07 pm, edited 2 times in total. An excellent and expensive MOC...well worth the invesment. I hope all your visitors envy this. That's awesome man. Also, you're free to post as many images of any size you want now, the forum will automatically shrink them to fit if need be. So you can edit out the spoiler tagged bits to make viewing easier. 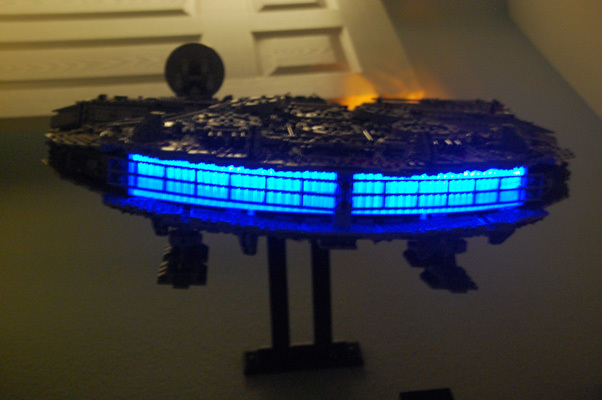 My entire tiny Lego collection bows in reverence to this work of awesomeness! Seriously, the wall-mounted idea is brilliant... I love it at that angle that makes it look as if it's soaring around the room. That's just brilliant work! I would love to see video on all the working functions! Hopefully you can load something on youtube down the road. I have to say, I wish I had that set, and that would be the perfect way to display it. Congrats on a great idea! that is GREAT! Awesome. Cool! But how exactly did you connect the mount with the Falcon? 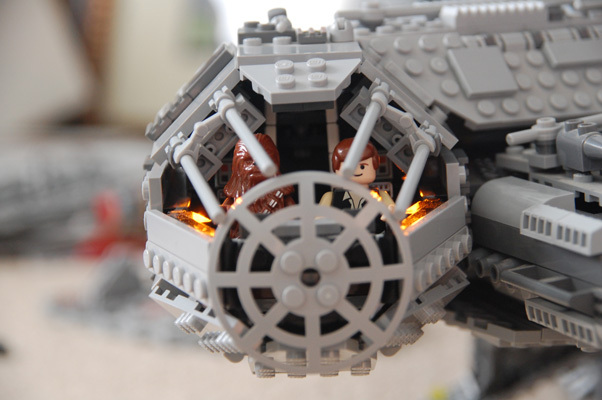 Any chance you could give us a step by step on how you attached the mount to the falcon? I'd love to do something like this! You've been creating things above and beyond the best MOCs for years and this just boosts your credibility by a ton. I've spent 20 minutes looking at your pictures and want more. Brilliant. 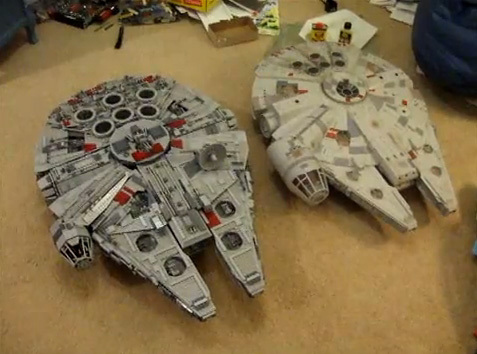 dustinmroberts wrote: Any chance you could give us a step by step on how you attached the mount to the falcon? I'd love to do something like this! Posted video with details regarding the mount. Let me know if you have more questions. Will post a video with the details of the MOC and features later. Last edited by etcknight on Sat Oct 15, 2011 9:36 pm, edited 2 times in total. Gooker1 wrote: That's just brilliant work! I would love to see video on all the working functions! Hopefully you can load something on youtube down the road. Uploaded video showing all the mods and added features. Bit nervous on camera, so sorry for all the "cool"s. Doh! thanks for the video. 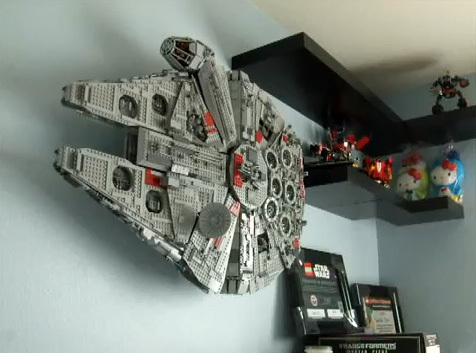 So you built this bracket with the black technic bricks, screwed these on the mount, and then connect the Falcon with these two red pins? Andi wrote: thanks for the video. So you built this bracket with the black technic bricks, screwed these on the mount, and then connect the Falcon with these two red pins? Yes, the bracket is built with black technic bricks and some plates for correct spacing and added stability. The MF sits on top of the technic bricks. The MF directly attaches to the rear of the bracket. There are about 4-5 red pins with technic lift arms which give additional support and connection. The weight of the MF is mainly held in place by the steel "L" brackets to which the technic pieces are screwed - but the Lego pieces are needed for added stability. Without the steel "L" pieces, the Lego technic bracket by itself will never hold up the weight of the MF. Also, keep in mind that I had to make some adjustments due to the modified super-structure and new gunner area I MOC'ed. 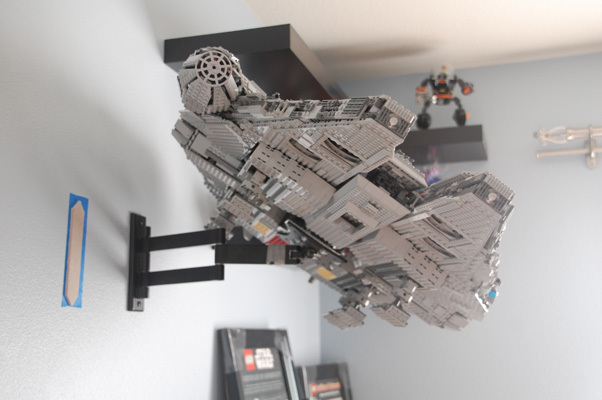 If you only want to mount the original model, your bracket will be slightly different and you can have more direct Lego connections. You will still need the steel "L" pieces! Let me know if you need more pictures or other questions. 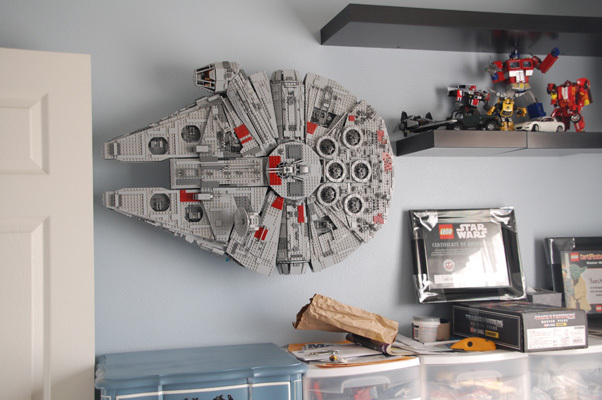 I'm pretty sure the instructions are on Lego.com now, also you will want to check out this thread where people have done exactly what you have in mind (but with Bricklink instead of PaB of course). So forgive me if someone else already suggested this but as this is one of the greatest ideas (your wall mount artwork of perfection,) I couldn't be bothered to read everyone else posts before suggesting you take it even further. Have you thought about building a back drop in the design of the side of the Star Destroyer that the Falcon hid on before being followed by Fett to the Bespin System? 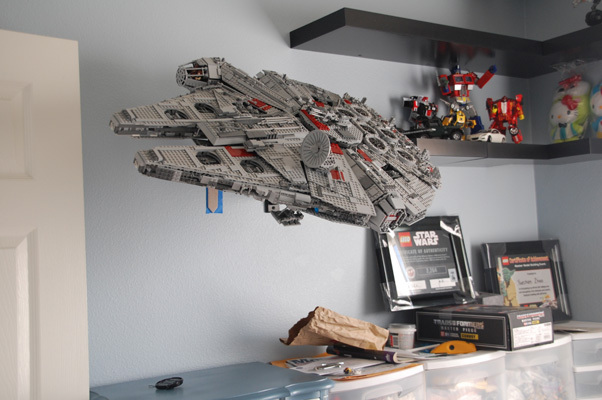 It would look so cool for about 8-10 large (48 stud) baseplates with greebling to be the back drop....nevertheless, this is now addes to my bucket list, or to-do-list. Amazing!!! I have just finished building mu own MF after bricklinking it. What a feeling of complishment! Now you have inspired me to mount it on the wall. If looked everywhere for a tv wall mount that can tilt 90 degrees upwards, and finally found one in a german webshop (none of the american amazon sellers would ship to Norway those suckers...). @bobalego - I am thinking about mounting some other Lego models near-by to give more of a dynamic sense, but never thought about the side of Star Destroyer idea. Pretty slick, love the creativity of displaying in a unique way.